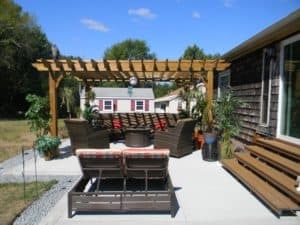 Outdoor structures that blend naturally with the landscaping are one of the top trending design features for homeowners. While metal pergola kits offer excellent qualities, the iconic look of a wood pergola is unparalleled. Pergolas that can blend your landscape with a functional quality structure is very popular in today’s outdoor designs. Finding the perfect match might require a little research and comparisons. What makes wood and metal pergola kits different? Traditional wood pergolas blend easily with many types of surroundings. The style choice of your pergola depends on your style of home or current landscape design. For example, a shiny metal pergola kit might work very well with a more contemporary home. But did you know, wood pergolas can be customized with end cuts and top slats to offer that same sleek look? If you decide you want to paint or stain your pergola, you have that choice with a wood pergola. So if customizing your pergola style with stain or color is important, you’ll be limited with metal color choices. Since you can paint the pergola wood, you have flexibility to design your pergola around your space with color choice. This classic white pergola with a coat of paint provides the same clean look as metal, but with the quality of wood. Some paints or stains achieve the same look as a metal pergola kit, with the durable long-lasting qualities of wood. Our Big Kahuna pine pergolas like this one have a very contemporary and sophisticated look, with the natural beauty of pine. What’s in your budget for your pergola kit project? 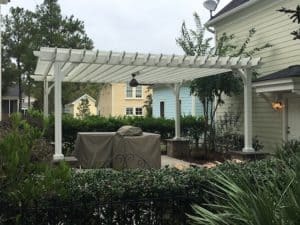 When it comes to pricing of metal pergola kits, there are multiple comparisons to make for pergola kits made from these materials as they are made by different manufacturers. 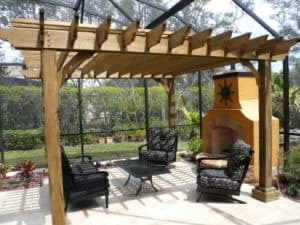 Some designs, whether they’re pergola kits from big box stores such as Costco or Home Depot have pergola specifications that are unique to that company or design. And the quality of their materials and workmanship will be different. Not really an apples to apples comparison. So a 15×17 pergola at a large online retailer may not be a direct comparison to a 15×17 pergola kit that a smaller manufacturer would cut and drill per order (like we do at Pergola Depot). The prices don’t compare since the quality and workmanship doesn’t compare. The same holds true trying to compare metal pergola pricing to wood pergola pricing. Apples to pears. Depending on the manufacturer, metal pergola kits may run a little less expensive than a standard wood pergola kit, but the durability and ability to withstand extreme wind and other weather conditions doesn’t compare. While the maintenance of metal pergolas might initially be less than wood, as time passes some metals would require regular maintenance to maintain their top condition. If they sustain damage, repairs can be challenging. The quality of the structure both aesthetically and durability just doesn’t compare to a solid wood pergola. With cedar, you can apply paint or stain right away and continue maintenance every other year. 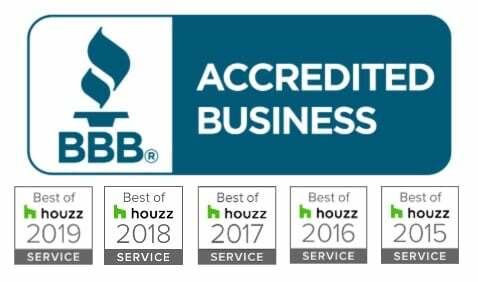 With pine, you can stain, water seal, or paint the wood a couple months after it’s installed, and then stain or seal every other year after that to maintain its beauty. The aesthetically pleasing features of these pergola wood types far outweighs the minimal maintenance required. Their ability to withstand high winds and other extreme weather makes up for that maintenance requirement. These lasting qualities make them a very attractive alternative to metal pergola kits. When I think of metal pergola kits, I think of high maintenance, heat attracting, typically contemporary-style outdoor structures. If you’re looking for that iconic clean look but one that more easily blends with the outdoors, consider wood as an attractive alternative to metal pergola kits. Pressure treated pine and cedar pergola kits offer qualities that are attractive for any outdoor project. Both types of wood take stain or paint which also gives you more flexibility with color choices than metal. Why cedar? Western red cedar has a beautiful light amber color and an appealing fragrance. Highly resistant to decay and bugs, Western red cedar is used for outdoor structure projects where exposure to the elements is continually severe. This type of wood takes paints and stains very well, is durable, and compliments any outdoor design. Pressure treated pine is durable, beautiful, and very strong. Pressure treated pine can withstand severe weather elements season after season and repels insects and rot very well. This sturdy wood can be stained, water sealed or painted after the pressure treatment dries (typically a few months). A cost-effective material for outdoor structures, pressure treated pine is a sturdy pergola building material that has a natural beauty with or without paint or stain. Since metal and wood pergola kits both offer excellent qualities, it comes down to your style preference. Only you can determine the most important features that fit your outdoor landscape. Keep in mind that our wood pergolas are durable, flexible, and a classic design that stands the test of time!